Requirement 1 for the Signaling merit badge is, "Make an electric buzzer outfit, wireless, blinker, or other signaling device." A century ago when the Signaling merit badge was introduced a Scout could not have fulfilled this requirement by building a device using transistors or integrated circuits. These had not yet been invented. Half a century ago you could have built the circuit below utilizing the CK722 transistor, which was introduced in 1953. You still could not build the IC circuit for a few more decades, but today you can. With signaling devices like these we are getting into the area of electronics, and if you'd like to build one you might want to discuss it with someone who is a counselor for the Electronics merit badge. 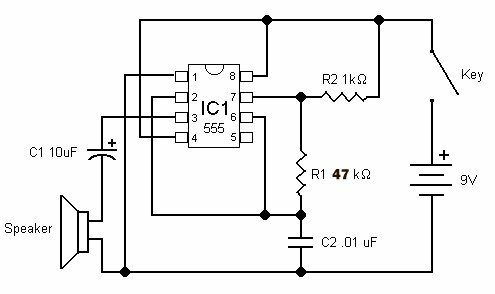 Here's a modern oscillator circuit suggested by Amateur Radio Operator KB3BYT.